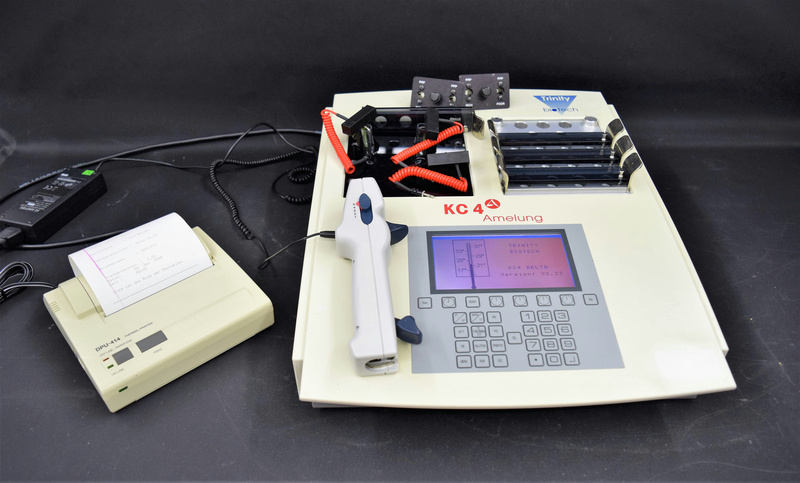 Trinity Biotech KC4 Delta Amelung Semi Automated Coagulation Analyzer 08N60866 . New Life Scientific, Inc. The KC 4 Delta is a semi automated mechanical clot detection system designed for the determination of prothrombin times (PT), activated partial thromboplastin time (APTT), fibrinogen concentrations and other clotting tests. Any clotting time test that has fibrin formation as its endpoint may be performed on the KC4. Measurement can be qualative or quantitative. When used in conjunction with appropitate reagents, the sample can be plasma or whole blood. New Life Scientific technicians were unable to fully test this instrument for full-functionality. However, this product is protected by a 90-day warranty. The analyzer powers on, heats, spins, and no errors were encountered during testing. The included printer and power cables are included. This product is in good cosmetic condition and showed signs of basic functionality.